After scouring the internet for all types of money challenges centered around dimes I found 2 things to be true. First, everyone loves talking about having a 2 liter full of dimes. And second, it seems almost no one has done it. On Pinterest you can find thousands of pictures that say you can save $400, $500, $600, or even $700 dollars by putting every dime you come across into a 2 liter bottle. You may even have enough to try your luck Zipang Casino which is ジパングカジノ in Japanese. The real varies depending on the bottle, with store brand round bottles being the best. It also depends on how the dimes land in the bottle and if the person is willing to shake and slam the bottle until the 2 liter full of dimes is really full. A safe estimate is $350, though most get $450 and even $500 but I wouldn’t count on that amount. But should you really be disappointed in $350? I mean that’s a car payment, or a debt payment, shoot some people can even go on a nice weekend retreat with that money. So how do you get the most out of the dime challenge? Don’t change anything. Just keep up with your typical spending plan and save any dime you have. If you use the cash envelope system or typically have cash you will save at least some dimes. This is the easiest way to do this challenge that doesn’t add any difficulty. Use more cash. If you want to kick the dime challenge up a notch then start using more cash. By taking a little bit of time and having cash with you, you will come across more dimes thus saving more. This does add extra work, but with extra work comes extra rewards. Ask for more dimes at the register. Whenever you’re at the store and you use cash simply ask the cashier to give you as many dimes as possible. I’ve seen some people actually get whole dollars worth of dimes back before instead of their dollar bill. It may seem like you’re robbing Peter to pay Paul but by focusing on the future and what you can do with that money it will make it easier. 2 Liter Full Of Dimes, Now What? The first thing to do with all those dimes is to sort them yourself and take them to the bank. This will be the most cost effective option. Though taking a lot of your time to sort out the coins, unless you have a machine that does it, it won’t cost anything to do it. Another option is to go to your bank, or a grocery store, that has a coin sorter. I’ve used one myself and it’s really quick and even a little entertaining. Taking a 2 liter full of dimes and pouring it out in there will sort it in less then a minute providing a receipt for you to take to customer service and get cash. The issue with this though is that it will cost you anywhere from 9% to 11% depending on where you go. You could leave the full bottle of dimes and start another one. If you have no real need for money or are saving up for something specific then starting again without cashing out the previous bottle is a great option. Having the storage for this is kind of important but with planning it’s possible. 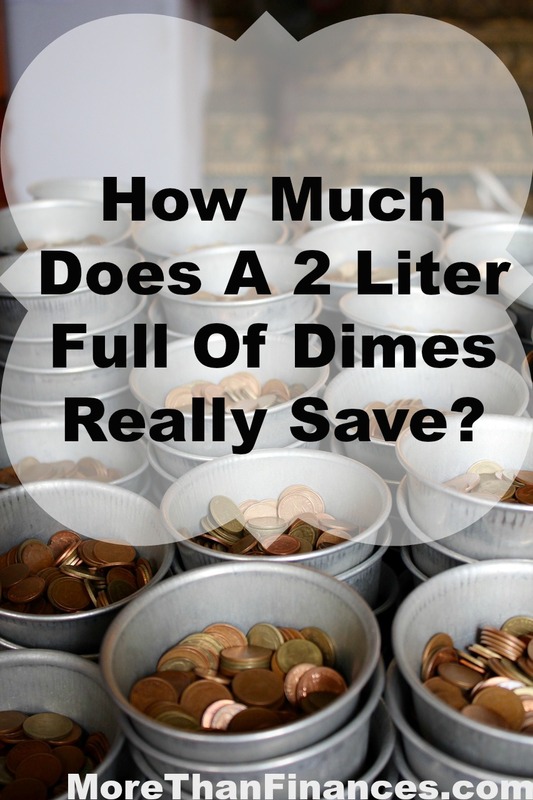 2 Responses to How Much Does A 2 Liter Full Of Dimes Really Save?